Creating your profile is the first thing you should do when you join StayCut.com. Although it is not required, I strong recommend it to take advantage of all that StayCut.com has to offer. The information is only used to personally calculate target amounts for all nutrients for your benefit, and it may also be displayed in your public profile should you choose to make it public (by default, it is private). If you're wondering how StayCut.com calculates target amounts, it uses the Mifflin-St. Jeor equation to calculate your Basal Metabolic Rate (BMR), and then multiplies that by a constant depending on your activity level to calculate your average daily calorie expenditure (maintenance calories). It was shown by the American Dietetic Association (ADA) to be the most accurate equation for calculating calorie expenditure. For your micronutrient requirements, it uses the amounts recommened by the U.S. National Academy of Sciences Dietary Reference Intakes (DRIs) for your age, gender, height and weight. 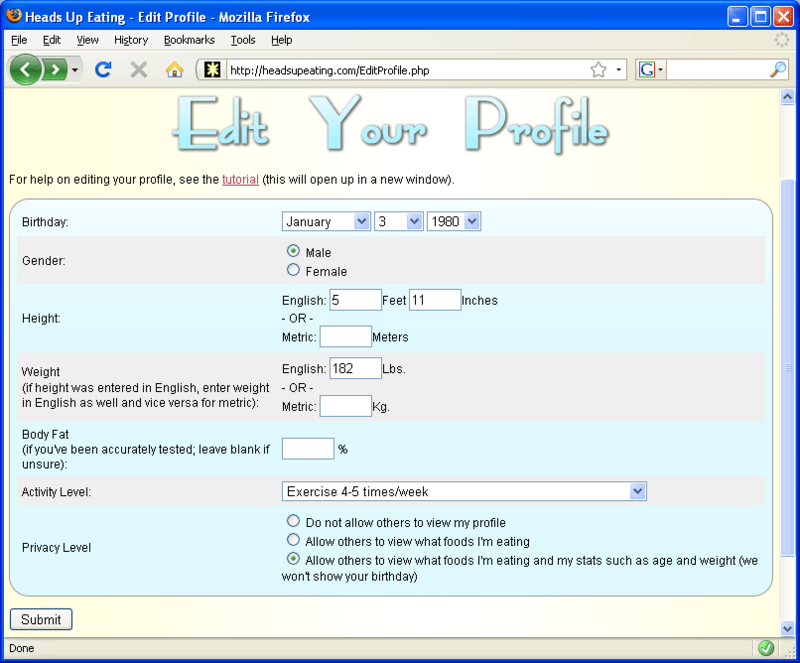 You will want to come back and edit your profile whenever your weight (or bodyfat %, if you know it) changes, because StayCut.com tracks these over time, and your nutrient requirements will change. You will also want to edit it if your activity level changes. I simply enter my information in here. Since I don't know my exact body fat percentage, I simply leave this field blank (as will most people). If your body fat has been accurately tested using a method such as hydrostatic or professionally using calipers, you may enter it in. It will give a slightly more accurate result for maintenance calories, and also StayCut.com tracks your body fat percentage along with your weight over time. When I'm done, I hit Enter or click Submit. This displays my stats, as well as allows me to set my target calories, macronutrient ratio, and select whether I'm in a sodium sensitive group or not. You need to set your targets here. 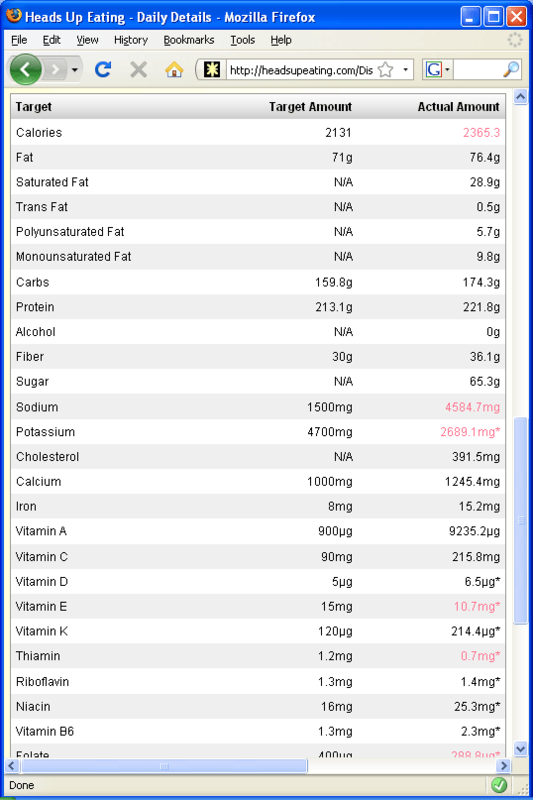 For your calorie target, StayCut.com gives you some guidance by calculating your maintenance calories as well as your fat loss level calories. If you want to maintain your current weight, you should put the number calculated for maintainance calories. This is an estimate of the number of calories you expend in one day, so when calories in equals calories out, your weight is maintained. 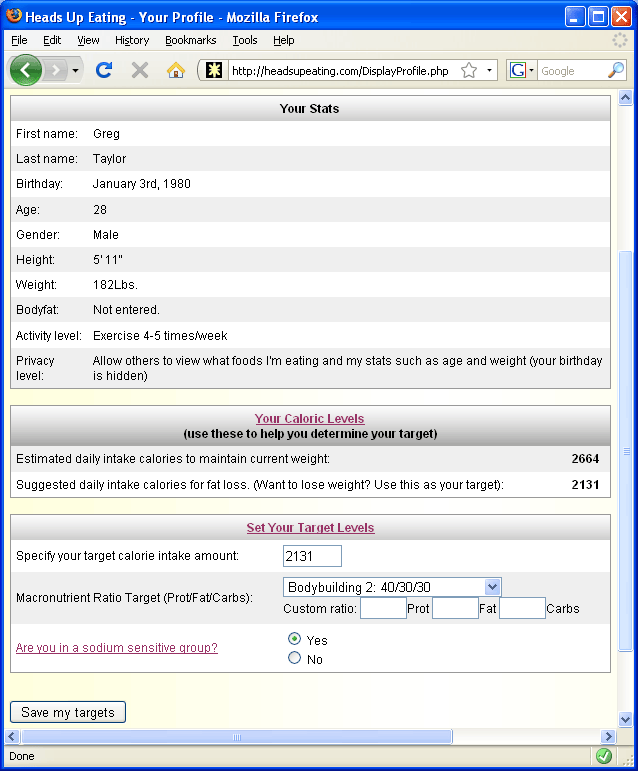 If you want to lose weight, you should put the number StayCut.com calculated for your fat loss level. If you consume the fat loss level amount of calories, and the information you entered was accurate, you should be able to lose about 1-2 pounds per week. It is not a good idea to go much lower than this number, as this can cause your body to go into starvation mode, you'll lose muscle, slow your metabolism, and likely gain the weight back (yo-yo dieting). Remember, it is almost always better to burn more calories rather than restrict more, so increasing your workout schedule and your corresponding activity level in your StayCut.com profile is beneficial. There are situations where someone may want to put in another number, such as if they are trying to gain weight, are contest prepping, etc., which is why you are free to choose your own number. As far as what you should put for your macronutrient ratio, this is often a point of debate. In general, most people will probably use either the USDA Daily Recommended or the Zone Diet ratio (StayCut.com recommends the Zone Diet for most people). If you're bodybuilding, choose one of the bodybuilding ratios. If you're on Atkins, there is a ketogenic ratio. You may also choose your own ratio. Some people believe the macronutrient ratio is not very important. In general, meeting your calories consumed target should be prioritized over meeting your macronutrient ratio target. According to the Institute of Medicine and the Dietary Guidelines for Americans 2005, sodium sensitive groups include individuals with hypertension, blacks, and middle-aged and older adults. It is recommended these groups consume no more than 1,500 mg of sodium per day, others are recommended up to 2,300 mg per day. Once I've entered in my targets, I will hit Enter or click Save my targets to continue. Now in my daily journal, I can see whether I'm meeting my targets or not, and I can tweak my diet as necessary. You'll find over time you'll get much better at determining what to eat using StayCut.com.